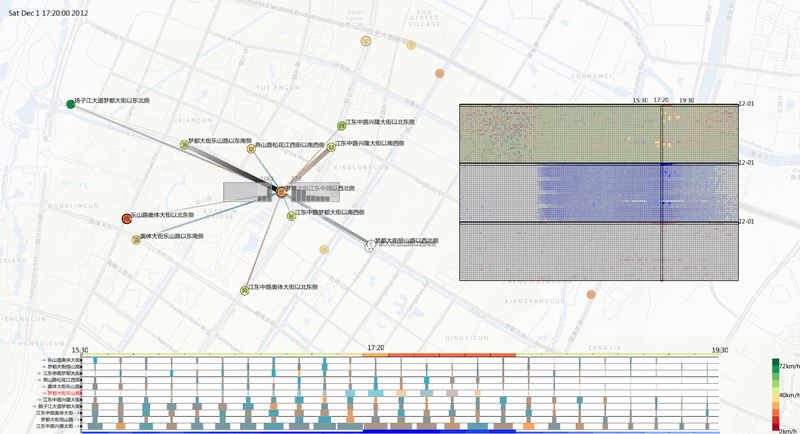 In this project, we develope a visual analysis system to explore sparse traffic trajectory data recorded by transportation cells. 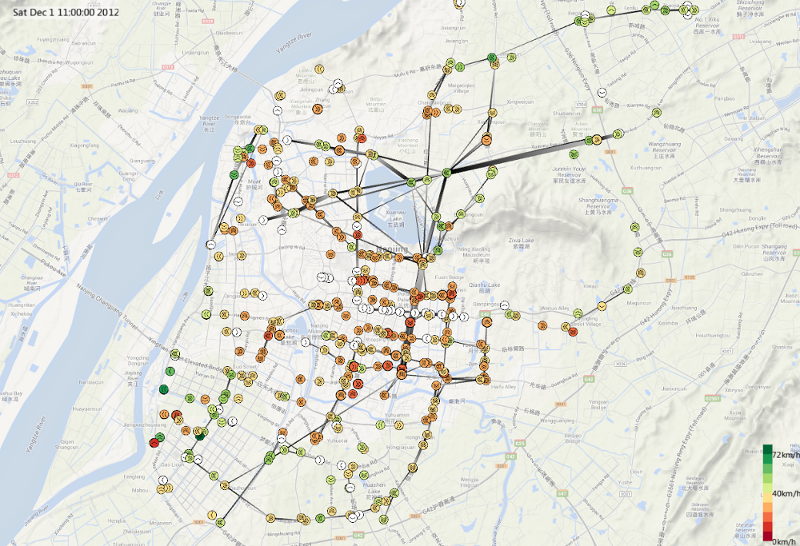 Such data contains the movements of nearly all moving vehicles on the major roads of a city. Therefore it is very suitable for macro- traffic analysis. However, the vehicle movements are recorded only when they pass through the cells. The exact tracks between two consecutive cells are unknown. To deal with such uncertainties, we first design a local animation, showing the vehicle movements only in the vicinity of cells. Besides, we ignore the micro-behaviors of individual vehicles, and focus on the macro-traffic patterns. We apply existing trajectory aggregation techniques to the dataset, studying cell status pattern and inter-cell flow pattern. Beyond that, we propose to study the correlation between these two patterns with dynamic graph visualization techniques. It allows us to check how traffic congestion on one cell is correlated with traffic flows on neighbouring links, and with route selection in its neighbourhood. Case studies show the effectiveness of our system. Zuchao Wang, Tangzhi Ye, Min Lu, Xiaoru Yuan, Huamin Qu, Jacky Yuan, and Qianliang Wu. IEEE Transactions on Visualization and Computer Graphics (VAST'14), 20(12):1813-1822, 2014.